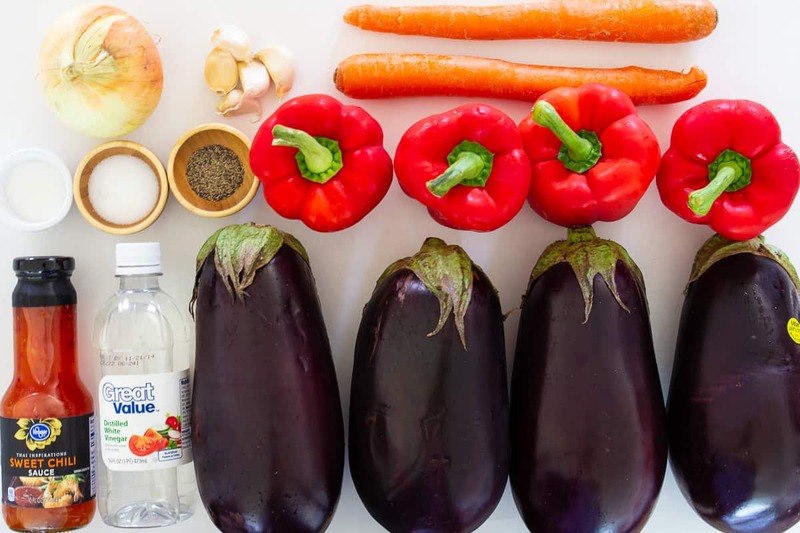 Roasted eggplants and sauteed vegetables drizzled with an easy and delicious oil-vinegar dressing. 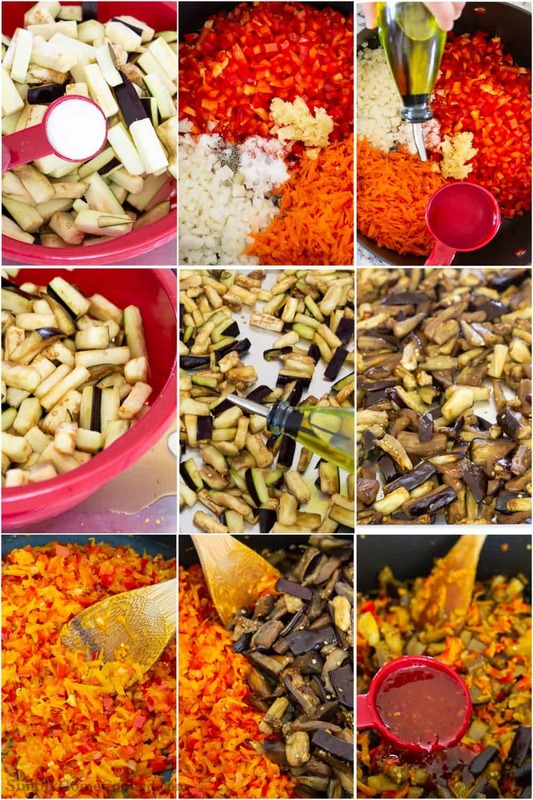 This will become your favorite eggplant salad recipe! Serve this salad with BBQ pork ribs for an unforgettable meal. This recipe was originally posted October 31, 2016, we’ve tweaked it a bit since then. This post may contain affiliate links. Read my disclosure policy here. This eggplant salad recipe was handed to me by my Mother’s aunt. Eggplants typically don’t have much flavor, but this salad is so flavorful it’s almost hard to believe. The savory sautéed vegetables combined with the sweet chili sauce makes quite the delicious concoction. Now that the holidays are getting closer, keep this salad in mind for the upcoming potlucks! 1. Chop the eggplant into small rectangular cubes. Place in a colander and mix with salt. Let it sit until it lets out most of its juices. Make sure to have a plate under the colander to catch all the liquid. 2. Sauté the chopped bell pepper, onion, and shredded carrot with the pressed garlic, black pepper, sugar, and vinegar. 3. Add water and olive oil. Sauté all the veggies. 4. Drizzle a baking sheet with olive oil and place the chopped eggplant into the baking dish a toss lightly to coat it in the olive oil. Bake for 25 minutes. 5. Combine the sautéed vegetables with the baked eggplant. Then stir in the sweet chili sauce. How long can I keep eggplant salad in the fridge? You can keep the cooked eggplant salad in the refrigerator for 3-5 days. Store it in an airtight container to maximize the freshness. 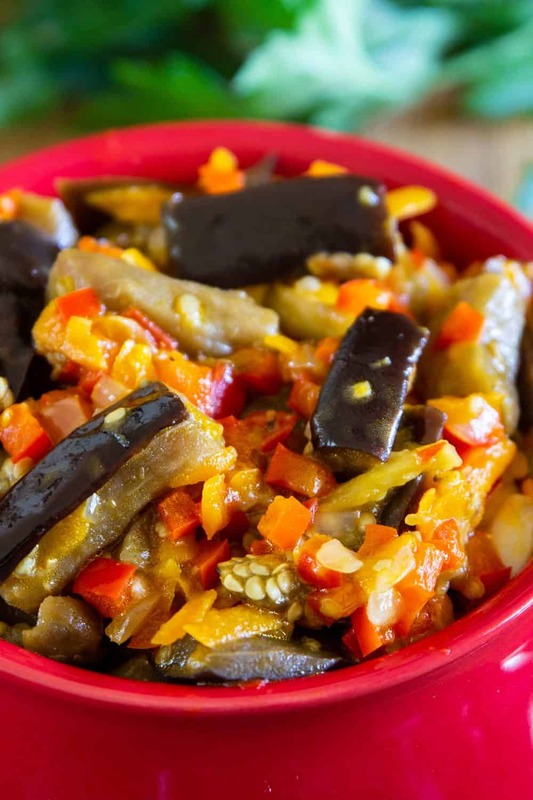 This roasted eggplant salad is a really light side dish. It compliments any meal – from vegan options to meat-centered ones. Chop the eggplant into small rectangular cubes. Place in a colander and mix with 1 tsp salt. Let it sit for about 20 minutes until it lets out most of its juices. Make sure to have a plate under the colander to catch all the liquid. Sauté the chopped bell pepper, onion, and shredded carrot with the pressed garlic, black pepper, sugar, and vinegar. Add water and olive oil. Sauté for about 10 minutes. 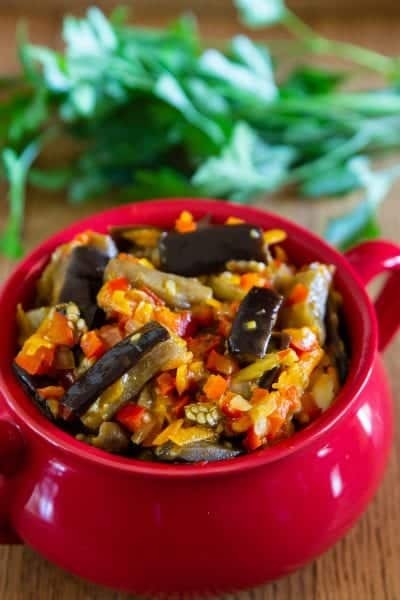 Drizzle a baking sheet with olive oil and place the chopped eggplant into the baking dish a toss lightly to coat it in the olive oil. Bake at 400 degrees Fahrenheit for 25 minutes. Combine the sautéed vegetables with the baked eggplant. Then stir in the sweet chili sauce. What about the vinegar? When do you add this List ingredient? Hi Hussam, I add the vinegar along with the oil and sugar.